President Trump and North Korean leader Kim Jong Un take a walk during their meeting in Hanoi, Vietnam, on Thursday. 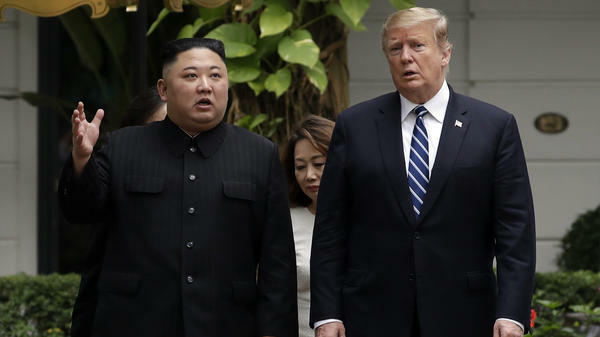 President Trump and North Korean leader Kim Jong Un, at their summit meeting on Thursday in Hanoi, Vietnam, expressed optimism about reaching a deal over nuclear arms. Asked by a reporter if he is willing to "denuclearize," Kim said, "If I'm not willing to do that, I wouldn't be here right now." Earlier, Trump had said he's in "no rush," adding "We just want to do the right deal." Kim, speaking through an interpreter, said, "From what I feel right now, I do have a feeling that good results will come out." The two leaders, meeting for the second time, continued to project a friendliness in brief remarks before reporters. Kim said that with the world watching their meeting, "it's like a fantasy movie." Trump responded, "The relationship is, you know, just very strong." Trump has boasted of forging a strong personal relationship with the North Korean leader. He and Kim renewed their acquaintance Wednesday night over a dinner of grilled sirloin and pear kimchi. This second summit in Hanoi, Vietnam, comes eight months after Trump and Kim's first meeting in Singapore, which produced only a vague commitment from North Korea to work toward denuclearization on the Korean Peninsula. Kim reiterated that commitment in a New Year's speech. But U.S. intelligence agencies say there's been little concrete progress in that direction. And they've expressed doubts that Kim will ever willingly give up the weapons his regime has spent three generations developing. The Trump administration says it will not relax the most stringent economic sanctions on North Korea until denuclearization is complete. But there are already signs that pressure on Pyongyang has eased. The Wall Street Journal reported this week that rice prices in North Korea have remained stable and the price of gasoline has fallen since 2017. The administration has also left the door open to rewarding North Korea before its nuclear program is completely dismantled. "We will sustain the pressure campaign. At the same time, we are trying to advance the diplomatic campaign, and we have to find the right balance between those two," Trump's special envoy to North Korea Stephen Biegun, said last month. "Areas like cultural exchanges or people-to-people initiatives ... seem to me a very obvious place where we could begin to make progress in that environment." Trump has said he's willing to be patient with North Korea, so long as the country refrains from conducting further tests of nuclear weapons or the missiles used to deliver them. The last such tests were in 2017. "As long as there is no testing, I'm in no rush," Trump told reporters at the White House earlier this month. "If there's testing, that's another deal." One goal of this second summit was simply to reach a shared understanding of what "denuclearization" means to the U.S. and North Korea. The administration also wanted to discuss a freeze on weapons and missile development as well as a road map for future negotiations. Biegun added that Trump is eager to bring a formal end to hostilities with North Korea. "The president of the United States is convinced that it's time to move past 70 years of war and hostility," he said. "There is no reason for this conflict to persist any longer." Biegun and other administration officials stressed, however, that any effort to formalize the armistice with Pyongyang should not be seen as a prelude to withdrawing the 28,000 U.S. troops currently stationed in South Korea. "We are not involved in any diplomatic discussion, full stop, that would suggest this trade-off," Biegun said in a speech at Stanford University.